Welcome to Episode 35 of Cold War Conversations. Thanks to Wayne Sherwood who left another 5 star review on Itunes. Your reviews on itunes, or alternative podcast platforms as well as your posts on social media helps raise the profile and helps us get new guests. 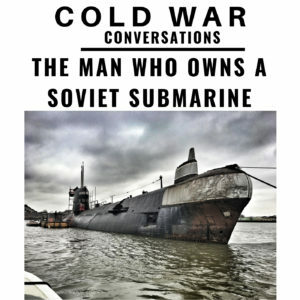 Today we talk with John Sutton who owns a Foxtrot class Soviet Submarine moored in the middle of the River Medway in Kent. This may seem an unlikely location for a Soviet submarine but John tells an interesting story of how he acquired it. Before we go further I’d like to thank all our Patreons who donate monthly to support the podcast further and get access to some exclusive extras. Now you might wonder what this Patreon stuff is I go about – in short it’s a way of you can help fund further podcasts. All I’m asking is if you enjoy the podcast to agree to pay as much as you can afford each month. You can cancel at any time and amounts as little as little as a $1 or a £1 a month really help keep us broadcasting and expanding the show. Just click here to visit our Patreon page. So back to the episode, after viewing some of the photos of the sub listing in the river, with some trepidation I boarded a fast Javelin train at London St Pancras and within 30 minutes I was in Strood and I could see across the Medway the low silhouette of the Foxtrot. We join the interview with John and I aboard his small launch in the middle of the River Medway.